8:55 a.m.: ring… ring… ring. Rigging and loading my custom-built Happy Trails Products Kawasaki KLR 650 for the first multi-day ride of the year brought a Cheshire grin to my mug. I hadn’t been out for a proper ride since the previous September, meaning a winter’s worth of pent-up throttle lust had gotten the better of me. With Idaho’s massive playground–approximately 30,000 miles of two track, fire roads and trails–yet again at my disposal, winter’s fickle barrier was no longer a point of frustration. Nolan, my neighbor and buddy from high school, rolled up to my house at 1:15 p.m. on his BMW 800GS (also outfitted by Happy Trails). He had a comparable look on his face. A quick fuel stop and we were making tracks over Rocky Canyon Road toward Idaho City. A few friends were celebrating a double birthday over the weekend at 10 Mile Creek on the South Fork of the Payette River. Nolan and I figured we’d join them for a night instead of heading straight for Garden Valley. After all, it was possible we wouldn’t be able to get over the pass between Garden Valley and Round Valley. An evening of revelry dissipated into a peaceful night’s sleep, set against the dull roar of the South Fork’s icy spring runoff. Up at 7:30 a.m.–bikes rigged. We burned tarmac into Crouch on Banks-Lowman Road pursuant of breakfast at Wild Bills. A hefty egg scramble was just what the doctor ordered, alongside a dark roast cup of joe. After breakfast, we pored over a series of U.S. Forest Service maps to find an alternate route, in the event that we got stymied by snow. Cruising serenely up the Middle Fork of the Payette river to Rattlesnake campground, I got the sense that a little adventure might be in store. The farther we traveled, the fewer people we saw. At the confluence of Silver Creek and the Middle Fork, we crossed the bridge to Road 670: gateway to Valley County (and Round Valley). It had been about three years since my last run over this route–a July trip with nary a skiff of snow in sight. A few Crouch locals had noted that people were still snowmobiling on nearby Scott Mountain. It was not a comforting notion given our mode of travel. A group of rednecks on side-by-sides nearly ran us off the road about midway up to the summit. Thankfully they were the last people we would see before getting back on pavement. At the intersection with the 693 loop road, we continued north on Road 670 over to the Bacon Creek cutoff. It was decision time. If we stayed on 670, we would surely run into snow–although the road loses significant elevation quickly, meaning we would stand a better chance of making it to low ground without incident. If we continued to ride the saddles on the ridge, we probably wouldn’t make it more than a few miles without hitting substantial snowpack. It was a no-brainer: 670 all the way. Not 300 yards down the south facing ridge we hit our first snow bank. The road was completely covered in about three feet of heavy, wet slop for a good 25 feet. I slowly lined up my front wheel with what appeared to be the flattest coverage and gunned it through without trouble. Nolan made it through cleanly as well. There was no turning back, as we could never get the bikes back uphill through that much snow–and neither of us brought a shovel. Less than a mile later we came across “the big one.” A shallow 60- to 70-foot snowbank covered a pitched section of road between two mogul-like whoops. I again lined up my front wheel and went for it. This time, the snowbank won. Not 10 feet in and my bike was buried up to the panniers. Frustrated, I hopped off the bike, which was now wedged perfectly upright–its full weight supported by the snow–and started walking downhill to scout the next few turns. 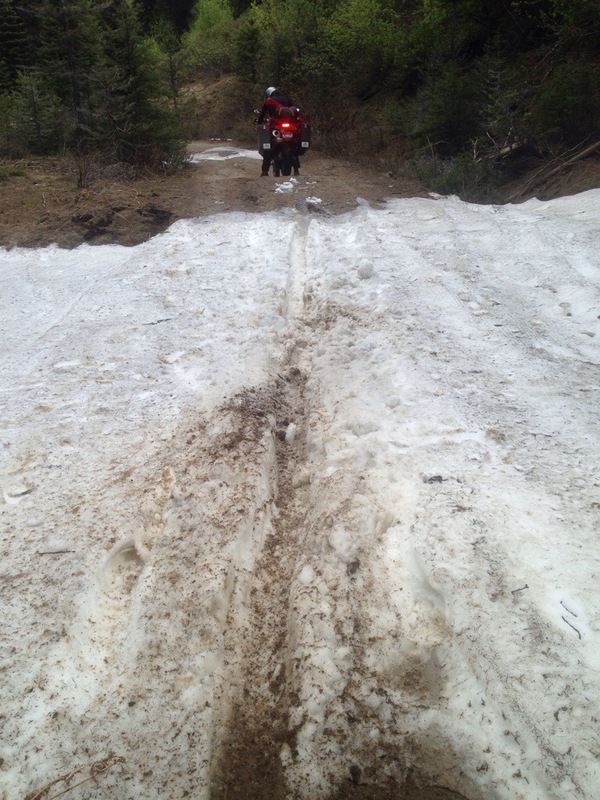 From the lack of tracks in snow or mud, it was clear no other vehicles had even attempted to traverse this route. Again, not a good sign. While I was gone, Nolan was kind enough to stomp out a path from my front tire to the downhill edge of the snow. With a little bit of lifting and cursing, we got both bikes through. If we weren’t committed to this route before, we sure as hell were now. We poked and putted along with the knowledge that we would be the first people to complete this route in 2014, as long as we didn’t have any more mishaps. As I meandered down the rough, rocky whoops of lower 670–feeling pretty good about our prospects–I felt my rear suspension completely compress, followed immediately by a loud, sickening snap. I thought for certain that I had flatted my rear tire–a fix that would likely take us into the evening hours on this steep loose section. I found a relatively flat spot to pull over and looked underneath my left pannier. I hadn’t flatted. I had however run over a load strap rated at 2,000 pounds that snapped in half under the rotation of KLR’s rear wheel. I was lucky this didn’t damage the wheel, or worse yet, buck me off the front of the bike into the adjacent ravine. I rearranged the load on my bike and we pressed on. Not far down the road, we got our first glimpse of Round Valley through the Ponderosa pines. 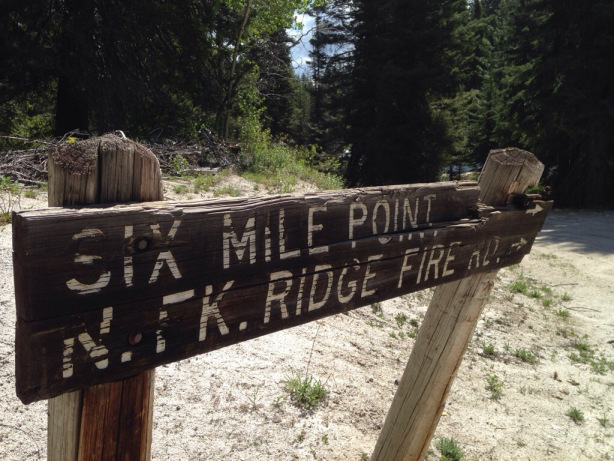 We made our way down to Highway 55 from Sixty Lane, and pushed into Cascade for some R&R. Two nights of sitting on the beach and doing some lower elevation rides, and we cruised back into Boise with a few good stories, some excellent pictures and a solid appreciation for our good fortunes. 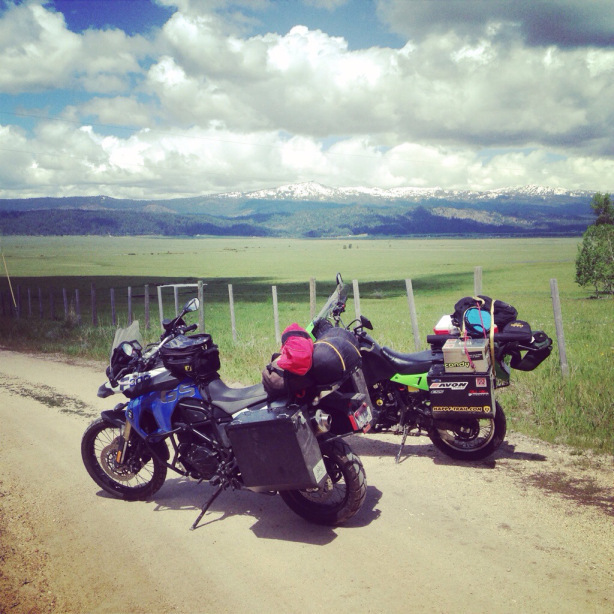 Total ride: 322 miles–about half on dirt. Posted in Places, Transworld TourTagged 10 Mile Creek, dual sport motorcycle, garden valley, idaho dual sport, klr 650, Round Valley IdahoBookmark the permalink.